Do you have a personal story to share? Have you experienced a patient-centered approach to your or your family’s healthcare? Tell us about it. What is your experience with the U.S. health system? What is working for you and what is not? This policy explains how the "Viewers share their stories" feature of WTTW's web site collects and uses information submitted by site visitors. We recognize the value of personal privacy and copyright protection and wish to protect your information and copyright holders. This "Viewers share their stories" feature is maintained and hosted as a collaboration between WTTW, and participating WTTW affiliate stations. You are responsible for the content of any information you submit to the "Viewers share their stories" feature of this web site. The Information posted on this feature does not necessarily reflect the views of WTTW and in no event shall WTTW assume or have any responsibility or liability for any information posted to this feature or for any claims, damages or losses resulting from the use and/or appearance of such information on this feature. By clicking the "Submit" button on any submission form in the "Viewers share their stories" features of this web site, you affirm that your submission, including text, digital images and video, is original to you, that you hold all necessary rights to this work or have permission from the copyright holder, or the work is in the public domain, and that the submission does not defame or otherwise violate the rights, copyrights, trademarks, publicity, privacy, or reputation of any third party. Under this agreement you will retain ownership of your submission. However, you hereby grant to WTTW and WTTW hereby accepts a perpetual, royalty-free, worldwide license to reproduce, distribute, prepare derivative works of, display and perform such information in any and all media now known or hereinafter devised and to authorize others to exercise such rights. You further represent that you have all necessary rights in such posting. You agree to indemnify and hold WTTW harmless against any claims asserted by any third parties that allege your submission violates their rights, or from any breach by you of your promises in this agreement. You shall be responsible for any costs incurred by WTTW for defense or settlement of third- party claims, including but not limited to WTTW reasonable attorneys' fees. You understand that submitting content does not guarantee that your work will be displayed on this web site. The decision of which and how submission received through the WTTW web site will be used will be at the sole discretion of WTTW. Stories and comments submitted and approved through the WTTW web site may be available for public viewing on the "Viewers share their stories" features at all participating WTTW affiliate stations. We collect personally-identifying information such as your name, location, and e-mail address on these pages only if you choose to provide that information to us. We ask you to provide this information when you submit a story via the "Share your story" tool, or make a comment on a story, or request to send a story to a friend. Please note, your name and location will be displayed on the WTTW web site and may be displayed on all other WTTW affiliate stations participating in the "Viewers share their stories" feature. In addition, you name and location may be displayed in connection with any use of your submission by WTTW or parties authorized by WTTW. When submitting your name, you are advised to use a name that you want the public to see. E-mail addresses will only be used for administrative purposes by WTTW. Your E-mail address will not be shared or sold to a third party without first receiving your permission. We limit the use of personally-identifying information to the following activities: identifying the contributor of a story posted to this web site, identifying the contributor of a comment about a story, and fulfilling your request to e-mail a story to a friend. We also may disclose personal information if required to do so by law or if we believe that such action is necessary to (a) comply with the law or with legal process, (b) protect against misuse or unauthorized use of the web site, or (c) protect the personal safety or property of web site users, the public or the Working Films and its employees. If you do not want your personally-identifying information to be collected or used for any of these purposes, you can simply 'opt out' according to the process described below. As you explore this feature, it is possible that several cookies will be set on your computer. A cookie is information a web site puts on your computer's hard drive so that the site can remember your preferences or which pages you visited on that site. These web pages use the information from cookies to deliver relevant local resources, remember browser preferences, and improve your experiences on the site. ?No personal information gathered in the "Viewers share their stories" feature will ever be stored in a cookie. WTTW do not sell information collected by cookies nor use the information for commerce-related purposes. By clicking the "Submit" button on any submission form in the "Viewers share their stories" feature, you signify your acceptance of the terms spelled out in this agreement. If you do not agree to these terms and conditions, please do not use this feature. We reserve the right to change this policy at any time. Any changes to this policy will be posted to this page as soon as reasonably possible, so please check this page periodically. Use of these pages constitutes consent to any policy then in effect. The "Viewers Share their stories" feature IS PROVIDED ON AN "AS IS" BASIS WITHOUT WARRANTIES OF ANY KIND, EITHER EXPRESS OR IMPLIED, INCLUDING WITHOUT LIMITATION WARRANTIES OF TITLE, NONINFRINGEMENT, OR IMPLIED WARRANTIES OF MERCHANTABILITY OR FITNESS FOR A PARTICULAR PURPOSE. NEITHER WTTW NOR THE MEMBER STATIONS WARRANT THAT ANY INFORMATION IS COMPLETE OR ACCURATE, THAT THE WTTW WEB SITE OR WTTW WILL BE UNINTERRUPTED OR ERROR FREE OR THAT ANY INFORMATION IS FREE OF ROGUE PROGRAMMING. UNDER NO CIRCUMSTANCES, INCLUDING NEGLIGENCE, SHALL WTTW BE LIABLE FOR ANY DIRECT, INDIRECT, INCIDENTAL, SPECIAL, PUNITIVE OR CONSEQUENTIAL DAMAGES THAT MAY RESULT FROM THE USE OR INABILITY TO USE The "Viewers Share their stories" feature, INCLUDING WITHOUT LIMITATION USE OF OR RELIANCE ON INFORMATION AVAILABLE ON The "Viewers Share their stories" feature, INTERRUPTIONS, ERRORS, DEFECTS, MISTAKES, OMISSIONS, DELETIONS OF FILES, DELAYS IN OPERATION OR TRANSMISSION, NONDELIVERY OF INFORMATION, DISCLOSURE OF COMMUNICATIONS, OR ANY OTHER FAILURE OF PERFORMANCE. YOU HEREBY RELEASE AND WAIVE ANY AND ALL CLAIMS AND/OR LIABILITY AGAINST WTTW, AND THE MEMBER STATIONS ARISING FROM OR IN CONNECTION WITH YOUR USE OF The "Viewers Share their stories" feature. YOU ALSO AGREE TO DEFEND, INDEMNIFY AND HOLD HARMLESS, WTTW AND THE MEMBER STATIONS, FROM AND AGAINST, ANY AND ALL CLAIMS OR LIABILITY, INCLUDING COSTS AND ATTORNEYS FEES, ARISING FROM OR IN CONNECTION WITH YOUR USE OF THIS FEATURE OR FAILURE TO ABIDE BY APPLICABLE LAW. If you have any questions or comments concerning this Submission & Usage Policy; would like to change, update or delete your personal information; or would like to opt-out of any future communications, please contact WTTW. Thank you for your interest in this feature. We hope you enjoy the stories submitted from "people like you." 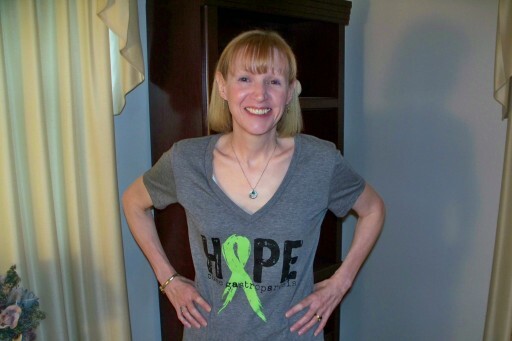 Since being diagnosed with gastroparesis, my life has changed in unimaginable ways – and the medical community, which did not initially recognize my needs, left me ill-prepared for these changes. In February 2014, I was hospitalized with severe pain and vomiting, put through a battery of tests, diagnosed, and sent home with only a brief explanation of my illness. No one prepared me for the seriousness of this condition. Perhaps they thought I understood, but I did not. I recall the doctors giving me an overview of gastroparesis. They told me it was “paralysis of the stomach” and impressed upon me that there was no cure. I remember them saying I would need to make some dietary changes, and if those didn’t work, there were a few medications to try – but they came with risks and negative side effects. I recall them telling me that in some severe cases, people would opt for surgery to implant a gastric electrical stimulator or resort to feeding tubes. Mostly, though, I remember them saying that some would recover almost completely over time and would not experience long-term effects. Of course, this last statement is what I believed would be the case for me. After all, I was in good overall health. Not a big deal. I would follow their liquids-only diet, work my way up to soft foods and solids, just as they indicated I should, and I would be fine. But it didn’t happen that way. I went home believing I would continue to improve; instead, my condition deteriorated. Within a couple of days, I started vomiting again and could barely keep down liquids. The attacks of pain worsened, and I became so weak that I honestly could not lift my head up. I told my family goodbye. I truly believed I would die. I had no idea what to do. I finally mustered up the courage to call my doctor and told him that despite the risks, I thought I should try one of the medications he had mentioned. He agreed, but because of FDA restrictions and requirements associated with my particular medication, it was two horrendous weeks before I could begin taking it. These were without a doubt the longest two weeks of my life. Since starting the medication, I have stopped vomiting (for the most part) and can now function well enough to make it through the day, but I still cannot eat without pain. It is clear to me now that I will likely never again be able to eat “normal” foods in “normal” amounts, and it is crystal clear to me that this is a life-altering disease from which there is perhaps no coming back. I have experienced levels of fatigue I previously thought impossible, endured unfathomable pain, and come to realize the horrors of hunger and malnutrition. I had no idea I would face this. The doctors left me in the dark as to how to cope with my illness should it not resolve itself, as I had believed it would upon leaving the hospital. I am thankful I now have a physician who is willing to listen to my concerns and partner with me in evaluating treatment options. He seems to genuinely care. But that is not the case for many in the gastroparesis community; they remain lost and confused, as I was immediately after diagnosis. They never find that competent, compassionate doctor. I hope that eventually we are able to establish a healthcare system that meets the needs of all. We need better care, better treatments, and a medical community that comprehends our needs.